Welcome to the Week 14 Running Back Rankings! The tight ends have been a bit of a pain in the rear all year so why would this week be any different? The bottom line is that, unless you are going against Ertz or Kelce, you have a solid shot at competing with a waiver wire addition. In worst case scenarios you can still add a guy like Ian Thomas, Chris Herndon or Adam, Shaheen. For DFS, I am looking to pay up because I can. Both Kelce and Ertz will be in my lineups a fair amount this week with a sprinkling of guys like Njoku and Reed. Ian Thomas and Shaheen are my preferred punt plays. I’ll get into the tight ends more when I do the DFS podcast on Saturday though I doubt a whole lot will change. Definitely feel like spending on tight ends this week. 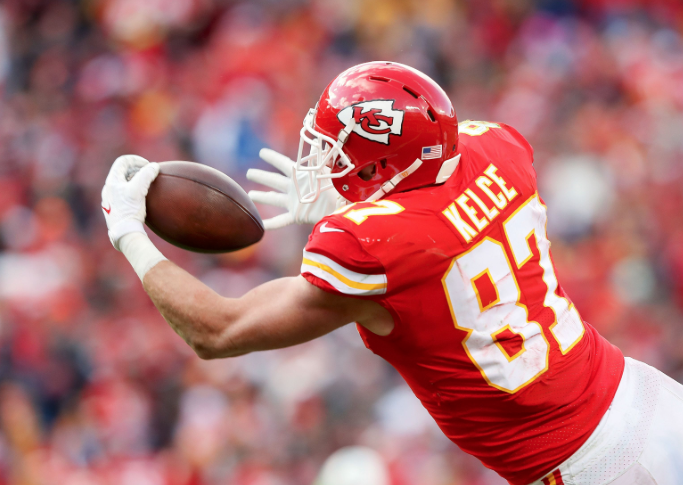 1 Travis Kelce KC 6.700 BAL@KC 12/09/2018 01:00PM ET Fire up the Kraken. 2 Zach Ertz PHI 6.400 PHI@DAL 12/09/2018 04:25PM ET He’s the central cog in their offense right now. 3 Eric Ebron IND 5.700 IND@HOU 12/09/2018 01:00PM ET Volume is locked in right now with Doyle long gone. 4 George Kittle SF 5.500 DEN@SF 12/09/2018 04:05PM ET Solid home matchup and with the receivers getting healthier, he should have more room. 5 Rob Gronkowski NE 4.800 NE@MIA 12/09/2018 01:00PM ET Gronk is looking better by my eyes. I’d have no worries playing him. 6 Jordan Reed WAS 4.600 NYG@WAS 12/09/2018 01:00PM ET I think Reed will be ok with Sanchez at QB. Sanchez can throw well defined reads pretty well and most of Reed’s stuff is pretty clean. Not a big downgrade. 7 Evan Engram NYG 3.700 NYG@WAS 12/09/2018 01:00PM ET Practicing fully so use him with confidence. The matchup is not great. ***UPDATE*** With OBJ out for Week 14, Engram and Sterling Shepard become the two main cogs in the downfield attack. He gets a bump up. I’d bump him even higher but it’s his first game back. 8 David Njoku CLE 3.900 CAR@CLE 12/09/2018 01:00PM ET The Panthers give up plenty of stats to tight ends, so he’s in a pretty good spot. 9 Jimmy Graham GB 4.400 ATL@GB 12/09/2018 01:00PM ET Had plenty of action thrown his way last week, so he’s ok to play. 10 Jared Cook OAK 5.200 PIT@OAK 12/09/2018 04:25PM ET No trust but his usage says he’s viable. 11 Vance McDonald PIT 3.800 PIT@OAK 12/09/2018 04:25PM ET The Raiders give up a lot of TD to tight ends. 13 Trey Burton CHI 3.400 LAR@CHI 12/09/2018 08:20PM ET Still viable and he gets his QB back this week. He’s going to be hit and miss but the hits can be big plays. 14 Chris Herndon NYJ 3.000 NYJ@BUF 12/09/2018 01:00PM ET Tough matchup for the Jets but they have Darnold back and he is aggressive and targets Herndon often. 15 Austin Hooper ATL 4.300 ATL@GB 12/09/2018 01:00PM ET Not a bad week to use him with Julio dinged up but the Packers tend to handle TEs really well. 16 Cameron Brate TB 3.500 NO@TB 12/09/2018 01:00PM ET Tough matchup. Very tough. He’ll be targeted because they have lost a few guys but this defense shut Ertz down, so be careful with your expectations. Not a guy I’m using on DK this week. 17 Ian Thomas CAR 2.700 CAR@CLE 12/09/2018 01:00PM ET He’s absolutely playable, but I like this matchup better for the Panthers’ receivers and RBs. 18 C.J. Uzomah CIN 3.500 CIN@LAC 12/09/2018 04:05PM ET Viable but this is a bad, bad matchup. Derwin James is wayyy good. 20 Adam Shaheen CHI 2.500 LAR@CHI 12/09/2018 08:20PM ET Have to see how they use him with everybody healthy, but he’s a potential weapon for them. 26 Ricky Seals-Jones ARI 2.700 DET@ARI 12/09/2018 04:25PM ET He may get more involved this week with all their injuries. 58 Jonnu Smith TEN 3.100 JAX@TEN 12/06/2018 08:20PM ET (ALREADY PLAYED) His QB may be hurt again so be careful. I like the way Jonnu is playing but Mariota’s hand is a concern.